Manually picked up fruit is delivered to our cold chamber by vehicles that are used only for this purpose. Brought up fruit is controlled by our technologist who is dealing with qualitative and quantitative analysis. 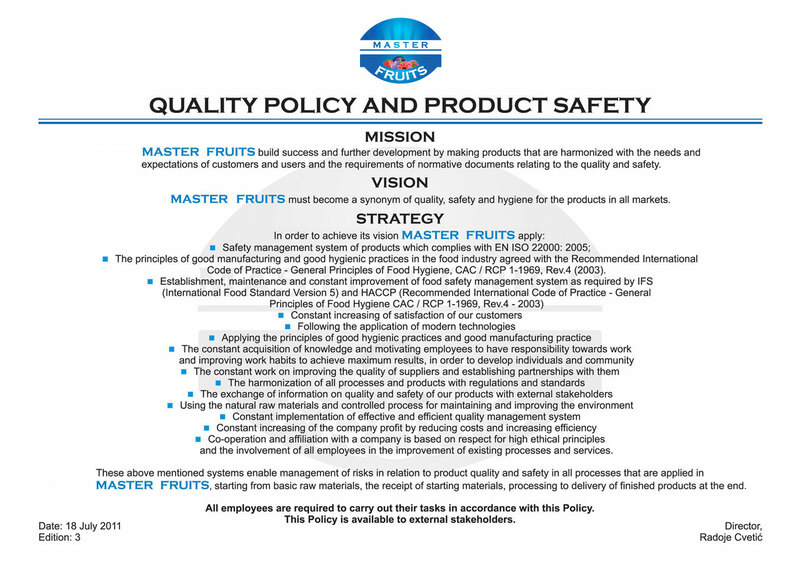 In accordance to plans of input control technologist is taking a sample of fruits and sends them to analysis to identify origin of the goods which is necessary for traceability procedure. Later on, fruit is being palletized and exposed to a cooling process to the temperature of 0-2 °C. 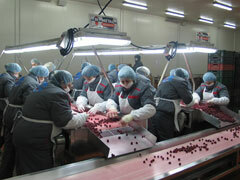 Next is the freezing of the fruits that is made in tunnels on a temperature of -30 °C. 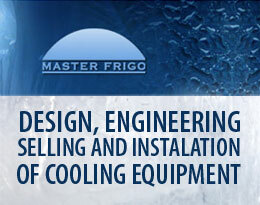 The freezing process is over when temperature off the goods comes to an -18 °C. Deep frozen fruit is been packed than into a boxes and storied in cold chamber on a temperature of -20 °C and in that stage is ready for processing. Fruit is processed in various quality categories and packed in different types of packaging which depends on customers needs. 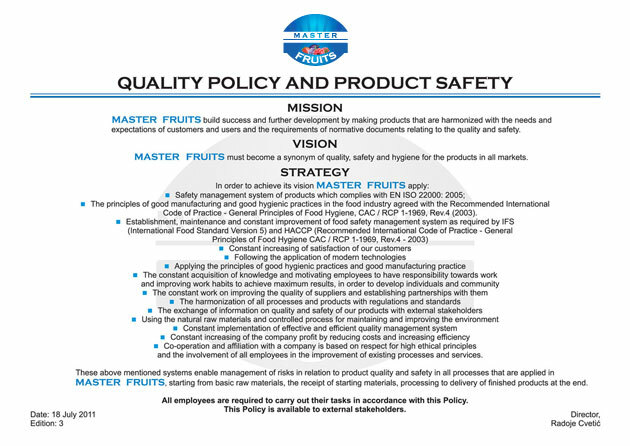 From the very opening MASTER FRUITS working process is in accordance to food quality control standards. In accordance to this we implemented HACCP, ISO 22000:2005, IFS, GLOBAL GAP and BRC standards. Every day improvement and modernization of production, storage and transportation process are guarantee of the quality of products we offer. Certificates we owe are our advantage but in the same time our duty to bring the quality of our final product to the excellence. In accordance to this we are working on the process of implementation of International food quality standard IFS (International Food Standard) and ISO 22000. With these certificates we are competitive on a global market and becoming a part of international supply chains. International certificates IFS and ISO 22000 issued by an independent third-party helps us to demonstrate to retailers that our product safety, quality and legal obligations are fulfilled. Traceability process is main core of all international standards for production and distribution of food. Producers which can assure implementing of IFS are getting a chance to gain customers confidence and assure their protection by producing safe and quality products. Our cold chamber is 11.07.2012. successfully certified quality system performance in accordance with the requirements of the BRC V.6 with grade A.